Oculus is worth seeing, but at the same time it is not. Half of the cast is excellent, while the other half was horrible (and two of the horrible half are excellent actors in other work, so I don’t know what went wrong here). Karen Gillan (Doctor Who) brought a real range of emotion to the role, and I feel she has transitioned well from her television performances to the silver screen. She really captured the personae of the tortured survivor quite well, and she is the rudder that guides this tale through its better portions. 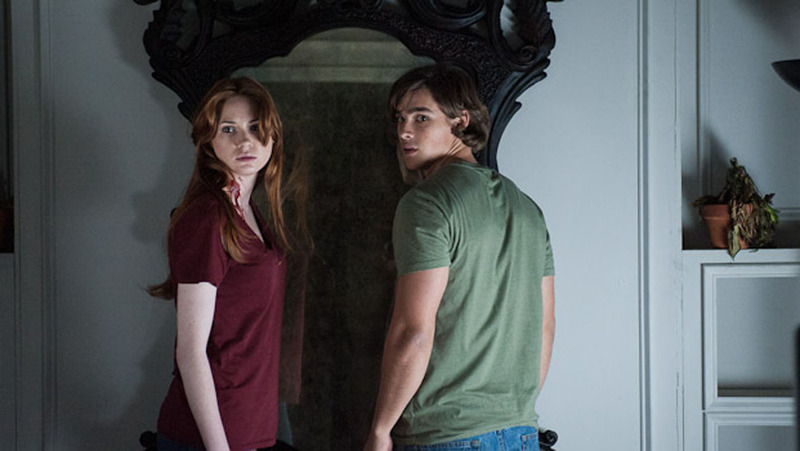 Annalise Basso (Bedtime Stories) and Garrett Ryan (Insidious: Chapter 2) brought their characters to life, and rarely do I feel so tormented about watching child characters suffer through the events of a horror film. I wanted to jump into the film to save them, and I attribute that drive to their talents. On the flip side of the coin, Katee Sackhoff (Battlestar Galactica, Riddick), as much as I love her, continues to demonstrate she has a certain range she excels at, and this role was beyond her range. Rory Cochrane (Argo, Dazed and Confused) was much better, but never really developed a character that had much impact on me. I am not convinced it was Rory, so much as it was the script he was working with, and possibly the directions he was receiving on the set. Brenton Thwaites (nothing worth noting) was just awful. It is obvious he was cast as a beautiful face to draw in the teen ladies, but the casting director should have checked to make sure he could act first. The writing was clever in places, and convoluted in others. It is so hard to critique this portion of the film without spoiling the film for you. There is a mechanic they used to tell the story, and honestly, I think it was a very interesting choice. That said, I think the production team got a little ahead of themselves, and the final product gets mired down in too much of a good thing. What worked quite well for the first three quarters of the film, caused confusion in the finale because it was used too heavily. I understand what they were trying to do. I just don’t think it worked out so well in the end. There are one or two mildly decent scares, but what suspense the movie manages to scrape up is lost in the convolution of how the movie plays out. Ultimately, this is where the film falls apart the most. This is supposed to be a scary movie, and most of it just isn’t. That is what disappointed me the most. There are things worth seeing in this movie, while there are also things that made me wish I skipped it. Tread carefully.